Welcome to our Caesars Casino review! Please don’t forget to contribute to the page by sharing your honest experience with other OnlineCasinoBluebook.com readers. 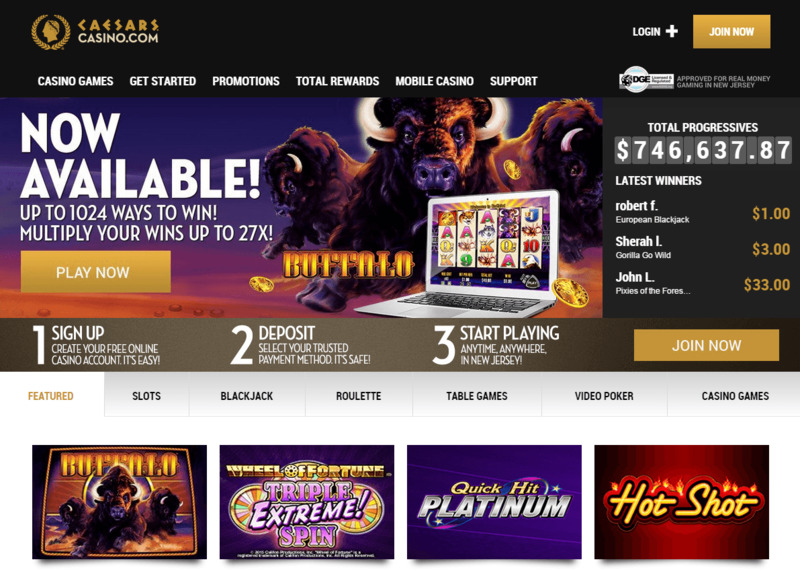 Caesar’s Casino is one of the very first internet casinos based in the United States and it is powered by one of the biggest brick and mortar casino giants in America and the world, Caesar’s Entertainment. This means that the casino can offer its players an unparalleled online gaming experience that is of high quality and that is 100% safe. The casino has a remarkable variety of casino games with dozens of gaming titles in each gaming category. These gaming categories include slot machines, blackjack games, roulette tables and video poker to name a few. The casino’s games are powered by Cryptologic, which means that New Jersey players will find an exquisite selection of games that are offered in great visuals that are accompanied by outstanding sound effects. The games also come with plenty of winning opportunities and high jackpot wins, especially the progressive games. The gaming titles offered include Armadillo Artie, Captain Nemo, Millionaire’s Club III, Frogs N Flies, Jacks or Better, Blackjack and European Roulette. Apart from its selection of varied games, the casino has a pretty easy to claim bonus as NJ players can claim $10 without having to make any deposits. All that they have to do is register an account and they will become eligible to claim the bonus. During the early phases of internet gambling in the USA, Caesars Casino is currently available to players who are accessing the casino from the state of New Jersey only. New Jersey players will be able to claim hundreds of bonus credits through the variety of bonuses and promos that Caesars Casino offers. It all begins with a simple $10 no deposit bonus. It is clear from the name of the promotion that players will not need to make a deposit in order to claim that amount. They will simply need to register an account and then they will become eligible to claim the bonus. Players can use the $10 in order to place real money bets on the casino’s games and keep any winnings that they earn. They will not be able to withdraw any winnings unless they make a deposit and it is when players can find yet another bonus that they can claim. The first deposit that NJ players do will be matched 100% by the casino, the bonus amount can reach up to $300. Players will then have to meet certain betting requirements before they can make withdrawals. At any moment if players choose to make a withdrawal before meeting these requirements, all bonus credits will be forfeit. Apart from the no deposit bonus and the match deposit bonus, players will find other bonuses and promos including the Total Rewards scheme with is basically a multi tiered loyalty program. It has 4 levels; these levels are Gold, Platinum, Diamond and Seven Stars. The graphics of the casino manages to transport players straight into the Las Vegas/Atlantic City environment; this includes the visuals of the games and the casino’s interface. The casino is not yet available to players through mobile but it will soon be able to deliver its experience through the mobile platform. Besides the high quality visuals of the interface of the casino, it is also quite smooth and user-friendly. It can be easily used by both, veteran players and inexperienced ones. Everything is laid out in a way to make it as easy as possible for NJ players to find the games or the page that they want to open. Caesar’s Casino does not offer a live dealer gaming section, but since the casino is owned by one of the biggest names in the industry, NJ players can expect the casino to add a Live Casino section real soon. Customer support is always standing by to assist players deal with any issues or answer any of their questions at any time during day and night. The 24/7 customer support service is reachable through many means of contact including a toll free phone, email and live chat. There is also a helpful and an informative F.A.Q page. Players can make deposits to their casino account after registering through 3 banking methods. These methods are ACH, Visa Card and MasterCard. All monetary transactions are encrypted and secured by state of the art encryption systems and firewalls. NJ players can cash out their winnings from the cashier of Caesars casino, UPSP Check, the Caesars Atlantic City Cage and through a bank transfer. Caesars Casino is an approved and a licensed internet casino by the state of NJ and it has all of the needed permits to offer real money gambling. It is 100% secure and safe and all of the games run on an RNG system. The casino also processes its payouts fast and offers players a 24/7 customer support service in case they come across any issues during their stay at the casino. The casino also has years of experience behind it, not in online gambling, but in land based gambling since it is owned and ran by Caesars Entertainment. It is also gambling responsible as it only accepts players who are of legal age. Caesars Casino is owned by Caesars Interactive Entertainment Incorporated. Its address is located at 2100 Pacific Avenue in Atlantic City, NJ08401. The casino has all of the licenses by the state of New Jersey to offer real money gaming to the residents of the state or visitors. 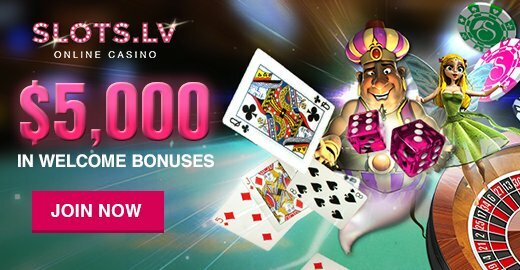 Caesars Casino is undoubtedly a recommended online casino for all NJ players who want to enjoy a smooth, a secure and a fair gambling experience through a regulated and an NJ approved site. The casino will certainly be a dominating name in the industry because it has all of the ingredients of success a casino needs including generous bonuses, a luxurious variety of games and 24-hour support to mention a few. Thank you for reading our Caesars Casino review!